This example test harness can be used to validate the 'Simplified I-V characteristics and event-based timing' variant of the Simscape™ Electrical™ N-Channel IGBT. 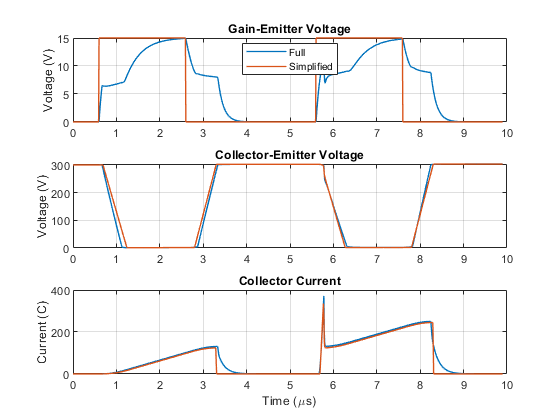 This variant only requires I-V data corresponding to the on-state gate voltage, and models turn-on rise time and turn-off fall time by making collector-emitter voltage a linear function of simulation time. Advantages of this approach are faster simulation and easier parameterization. 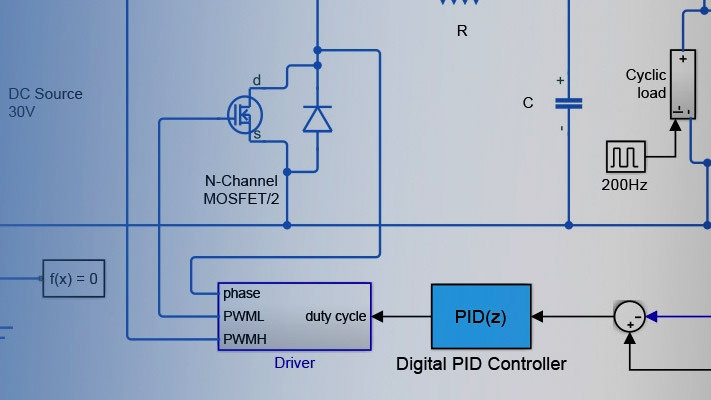 The test harness can be used to demonstrate that timing characteristics for this variant are very similar to those for the 'Full I-V and capacitance characteristics' variant. To select between variants, right-click on the N-Channel IGBT block, and select 'Simscape block choices'. Both variants have been parameterized from the same datasheet. The only event-based variant parameter that requires tuning is the Miller resistance. This is adjusted so that the current spike matches when turning on a load with pre-existing freewheeling current. 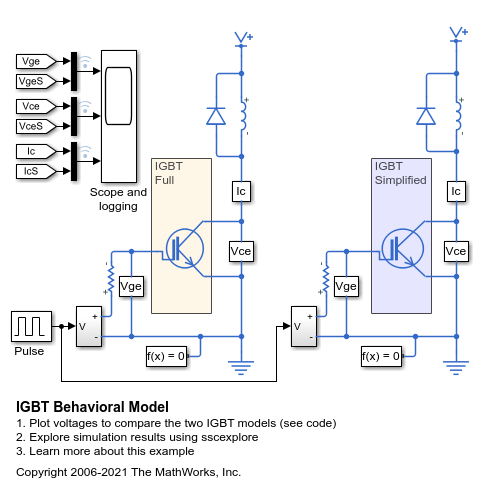 The plots below compare the behavior of two of the IGBT models available in Simscape Electrical. The simplified variant provides similar behavior as the full variant, and has been tuned so that the current spike matches when turning on a load with pre-existing freewheeling current.